Having built a small, portable 10.000V reference using the Analog Devices AD587 reference chip, now is a good time to evaluate its performance with a bunch of multimeters. Today’s contenders. 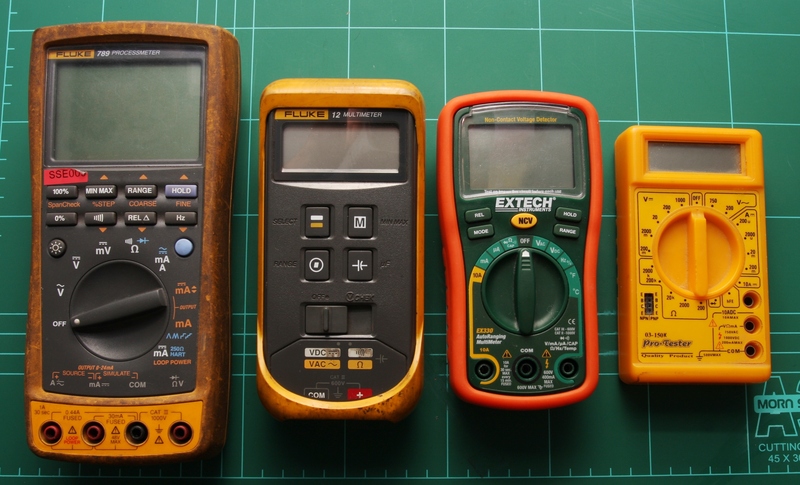 From left to right; Fluke 789, Fluke 12, Extech EX330 and Pro-Test 03-150K. Last week I had to have a huge tidy-up of my workspace, things were getting out of control. Finished projects, half completed projects, tools, test wires, components and general junk were just piling up. It was becoming unworkable – things were getting lost, projects forgotten and enjoyment was fading. Whilst watching YouTube (to avoid the inevitable task of cleaning up), one of those YouTube “Recommended” videos popped up with Adam Savage talking about his workshop. Anyway, in typical Adam Savage fashion, he said a few one-liners. One of them being, “Drawers are where things go to die”, 0:58. I had a laugh at this, thought nothing of it, watched some of his video about his tool stand and stopped watching after about 3 minutes because the whole video is about a tool rack. Following on from a previous post discussing the Analog Devices AD587 precision 10.000V voltage reference, I built a portable device to utilise the chip. A low battery indication was a desired feature to prevent the device being used in an important test and the battery level drops low and compromises the AD587’s performance. A simple green LED will suffice. Output performance of 10.000V (± 5mV) couldn’t be compromised so there is no protection to prevent high current draw from the chip, I’ll just have to be sensible. Battery powered AD587 10V reference. Voltage references are a humble piece of hardware, their sole function is to provide a stable, known voltage. This constant, known value of voltage can then be used as a reference for ADCs and DACs as well as provide a precision current source. I recently got hold of an Analog Devices AD587KN high precision 10.000V reference chip. This model of chip has an output value of 10.000V ± 5mV (that is, an output value of 9.995V to 10.005V) straight out of the factory. A voltage drift of 10ppm/°C at 25°C meaning that the output voltage will drift by 10μV for each 1°C the chip is exposed to. Additionally, the chip has a voltage trim input, so if you have access to a precision voltmeter, the chip’s output value can be adjusted even closer to 10.000V. Following on from a recent teardown of a low cost appliance energy meter, I’ve done a bit more hacking of the device. As you may recall, I identified that one of the pins on the meter’s chip (EOUT) output a train of pulses proportional to the energy consumed. Some tests with a multimeter seemed to confirm this because the average voltage of EOUT changed with the appliance wattage. I was hesitant to connect my logic analyser to the meter to measure the EOUT pin because of potential differences in voltage levels. To resolve, this I quickly whipped up a small board with a 4N25 opto-isolator to provide some voltage isolation between the internals of the energy meter and my logic analyser. The circuitry that allows for isolation of voltage levels is based around a 4N25 opto-isolator. An opto-isolator allows for a signal to be transferred using light, this provides an airgap which provides electrical isolation. Draw me a flex sensor?